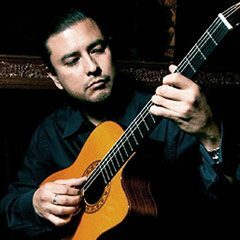 Versatile guitarist and Latin GRAMMY-nominated producer Andy Abad is known for his mastery of a wide spectrum of genres including pop, rock, and latin. Currently Abad is fronting his own band, The Blue Agave, while also serving as guitarist for Jennifer Lopez’s “All I Have” residency at Planet Hollywood in Las Vegas. He has toured with artists such as Marc Anthony, The Backstreet Boys, Josh Groban and Clay Aiken. His work can be heard on Lady Gaga’s album “Born This Way,” Bonnie Raitt’s “Silver Lining” and Marc Anthony’s “Libre” among countless others. In 2012 Abad arranged the song “Somethin’s Rattling” for Benjamin Gibbard (Death Cab For Cutie) and served as musical director/guitarist for Ben’s solo performance on the Conan O’Brien Show. His credits with Latin artists include Juan Gabriel, Pepe Aguilar, Joan Sebastian, and Paulina Rubio. As a composer he has written featured songs for Nickelodeon’s hit franchise “Dora The Explorer” and “Go Diego Go.” His music can also be heard on “Oprah,” “the Ellen Degeneres Show,” and “One Tree Hill.” Abad holds a masters degree from the USC Thornton School of Music, where he is currently on faculty at the groundbreaking Popular Music program.